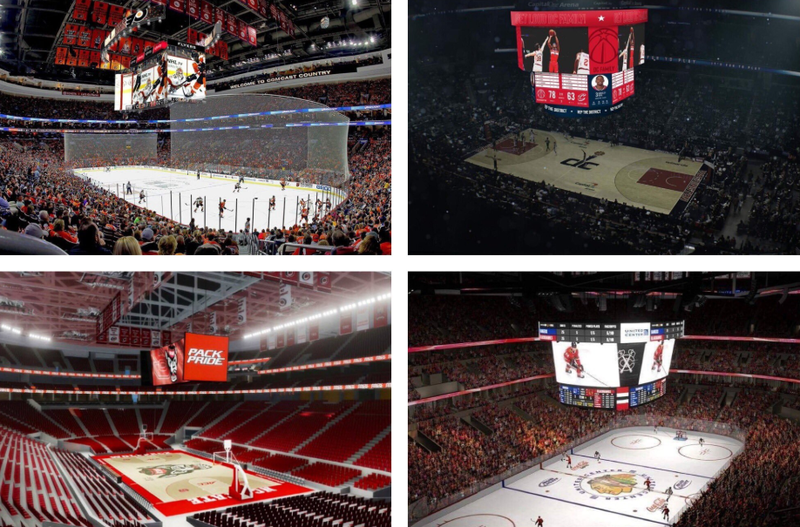 We have now seen renderings for 4 of the 6 known new scoreboards for next season. Now we are taking a look at the numbers. This team needed a new board for sure. Built in 2006, this is one of two boards left in the league with the old school analog style scoring. The main video screens are 21 feet by 13 feet. The new scoreboard looks to be pretty impressive in terms of bells and whistles and the fact that it is “kinetic”, but I was a little puzzled at why they didn’t go a bit larger with the main video screens. Those screens will be 32 feet by 18 feet which matches the dimensions of the Maple Leafs scoreboard. Like the Leafs, they seem to be sacrificing some extra space to allow for a view of the interior of the board. 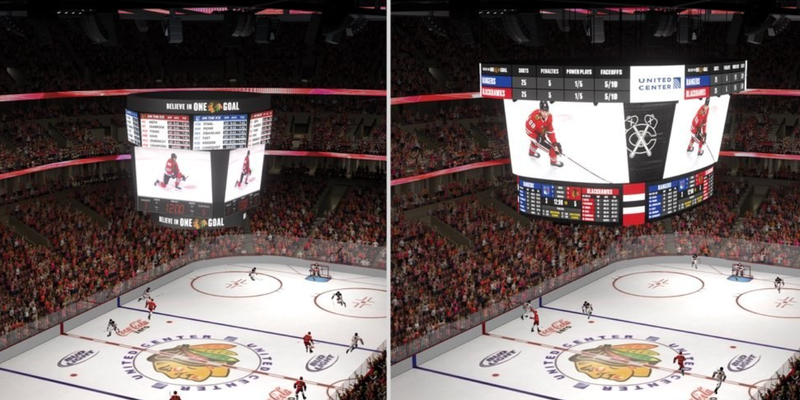 Toronto has a giant color changing leaf structure inside, while Chicago has interior video screen which can lower out of the scoreboard when needed. I am not sure “needed” is the correct word there. None-the-less, when the scoreboard is in its normal gameplay state, it should look really impressive and the size will certainly be adequate. As a Blues fan with similarly sized main video screens I can tell you, they are plenty big. So despite some things that caught me off guard and the fact I am not a fan of the corner screens that move, I think this is going to be a really cool video board and certainly one of the league’s finest for a few years. We do not know much about the main video screen size so this one will be tough. I was actually a little surprised to see they were replacing their scoreboard. It was built in 2007 but seemed rather advanced for its age. In reality, it wasn’t all that much bigger than Chicago’s board and I am sure being over 10 years old, the technology has become more difficult to replace. What we do know is they seem to have gone with a more vertical style scoreboard which can become even more vertical when needed. They also highlight that the action can stretch to the corners of the video screen which will make the picture even larger. However we have noticed that if they do that on two sides then the opposite sides will have to be confined to just the main screens. I am not sure how I’d fell trying to watch the game on the ends and having to see both corner screens showing action from the other side. I am not a big fan of seamless video screens like this or the one in Detroit anyway. I find them distracting. 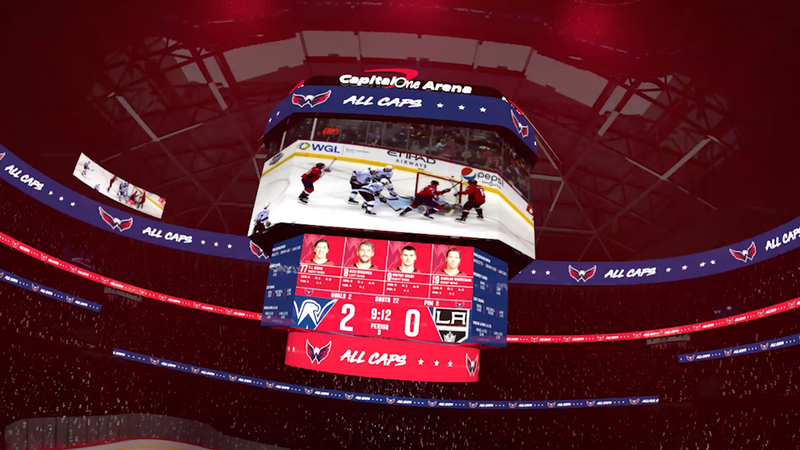 They also show gameplay on the underside of the scoreboard as well as a ring that partially covers that gameplay up. What is that about? Surely they will not actually show gameplay there. We will have to wait and see this thing when it is actually in use to see how they are going to make it work. We REALLY do not know much about this board. So far only one rendering has surfaced and the knowledge that it will stretch blue line to blue line. It is very long, but not very tall, so the main video screens will likely have 16:9 video replay area in the center and then scoring and stats on both edges. Then of course there are the tiny video screens on the ends because some rinks do not care about the fans that sit on those ends. Sorry, but they haven’t learned from Tampa who lets their end zone fans watch on a portrait layout iPhone screen. Colorado has found a way to at least give those fans a pretty decent sized end screen and the fans seem to be happy. We will hold off on saying much more about this board until we have some numbers to play with. 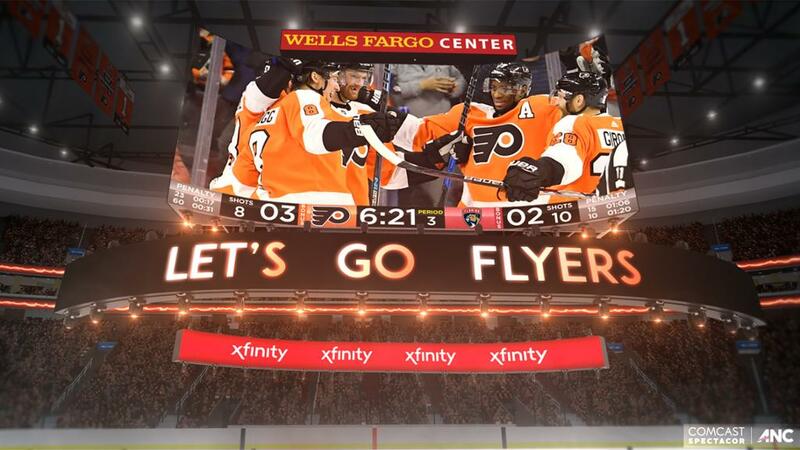 The Flyers are replacing their 2006 scoreboard which had virtually the same dimensions as Chicago with their main video replay capability. Their new board looks like something out of a Transformers movie. In its extended state, it would appear to closely resemble the Cleveland Cavalier’s scoreboard both in size and shape. The main screens would be 30 feet by 28 feet in its compact layout, but can extend to 60 feet wide. The end screens will be 22 feet by 28 feet. 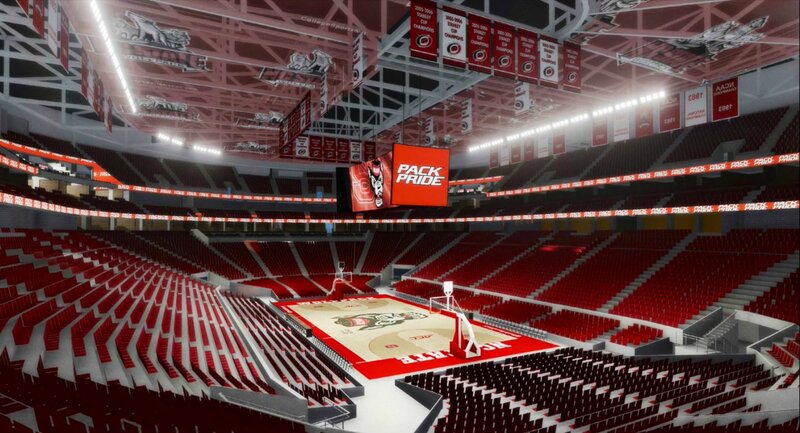 Hopefully given that they are much closer to the end seats, maybe it would be large enough for those fans. This board could be the most impressive of the bunch or at least of the ones we have seen so far. 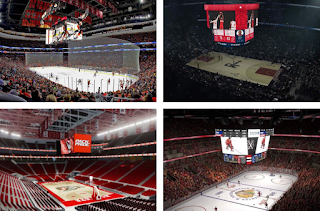 We are still waiting on Boston and Nashville to release information regarding their new boards for the 2019-2020 Season. I could see Boston going a bit more conservative, while Nashville could give Philadelphia a run for their money. And there is always the possibility that another team will surprise us with a new board. Last year New Jersey kept a pretty tight lip about what would turn out to be the largest scoreboard in the league. Stay tuned for more information as the remaining boards are announced.